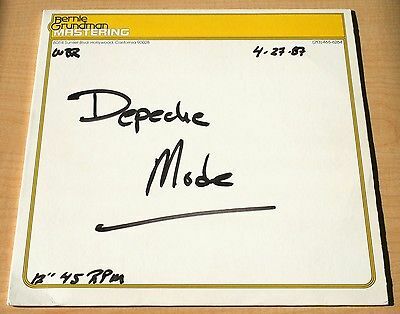 DEPECHE MODE....STRANGE LOVE EP- Strange Love 6:32 and 1:38/Strange Love 6:10 and FPMIP 5:19. BERNIE GRUNDMAN MASTERING one 2-sided 12" Acetate, Lacquer, Dub Plate in custom sleeve!!! This isan Ultra-rare one 2-sided 12" Bernie Grundman Mastering U.S.A. acetate in custom heavy slip cover(see description below on acetates). The tracksare as follows:Side Ais "Strange Love" 6:32 and 1:38. The flip side is "Strange Love" 6:10 and FPMIP 5:19 Onlya fewof these discs were ever produced. Thisis in Near Mint condition with nice shiny surfaces (see pictures). I amVERY particular (check my feedback) and this is not like the trashed acetates you see so many of that are almost dull in finish from having been played like a record over and over. I have stored this disc out of the light in a protective sleeve and in a smoke-free environment. Each acetate is unique (see comments on acetates below).Don't miss out on this rare opportunity to obtain an amazing acetate.This is also guaranteed to be authentic and not one of the many "fakes" being produced in Texas and elswhere and sold on Ebay these days.